Have you learned the 3 ball cascade yet? It is a lot easier to build your way up to learning clubs, by practicing with juggling balls first. Most of the tricks you can do with balls, can be done with clubs also. Step 1 – Practice throwing one club from side to side in an arc that is a little above head height, until it is fairly consistent. Throws should not be out from your body, but upwards. The club should do one complete spin and you should be able to catch it cleanly by the handle end. Step 2 – Hold one club in each hand. Toss one as before. As it reaches its peak, toss the other club inside the first one, to the same height. Step 3 – Two clubs should be held in your strong hand, and one club in your weakest hand. Start by throwing one club from the stronger hand. When the first ball peaks, toss from the opposite hand. When this club peaks, throw from your first hand, and keep going… You may need to experiment with different ways of holding two clubs in one hand so that you get a good first throw. Remember that dropping is a sign of progress… Some people suggest that it helps to build up to 3 clubs by using one club and two balls. Other people say that this is more distracting, as you have to get used to doing two different kinds of throw (a normal ball toss and a club flip) during one routine. 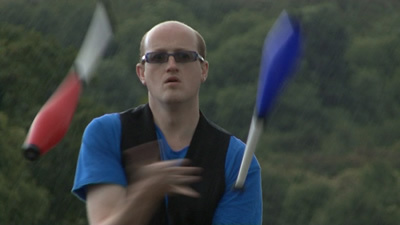 If you are having trouble learning to juggle 3 clubs, then give it a try and see if it helps! Reverse Cascade The opposite of the Cascade. In the cascade, the clubs are always thrown underneath each other. In a reverse cascade, every club is thrown over the top of the previous club thrown.. Imagine an open bucket at eye level in the centre of your body. All the clubs must be thrown into this bucket and caught by the opposite hand. Reverse Arms The cascade pattern, but with your arms reversed (your left arm is over at your right hand side and vice versa). Instead of a cascade throw, you throw the club under the opposite arm, to be caught by that hand. This is a trick that can be built up gradually. Every club thrown from one hand goes over the top of the other two clubs, which are just swapped from hand to hand. Once this is mastered, you can then try just throwing the same club over the other two back and forth (just like a tennis match with the other two clubs as the net)! Under the Legs Begin by using just one club in your left hand and throw it under your left leg so that it can be caught by the right hand, then throw the club under the right leg so that it lands back in the left hand! Once you can do this smoothly, you are ready to attempt under the leg while juggling the 3 club cascade pattern! If you are struggling then try either doing a double spin or a really high slow spin. This allows the club to go a bit higher and gives you longer before you need to catch it. Wrong way round / Half flips Begin by holding all clubs by the opposite end. You can try and keep juggling with the clubs facing the wrong way, or during the cascade pattern apply half a spin (or 1.5 times spin) to the club and catch it the proper way round. You could start by juggling the cascade normally and then flip the clubs so you catch them the wrong way round, then flip them back again. This is a good comedy trick! Chops A chop is made after you have caught a club, when you rapidly carry the club downwards (chopping motion) into the middle of the pattern. The following throw is under the arm that just chopped a club. You should be able to work up to chopping with every throw (both hands doing the chopping). You can then work on making your throws higher and wider to make the trick look really impressive! Chin Rolls When juggling a 3 club cascade, try placing one of the clubs (upright with the knob facing down) on top of your chin. The objective of this is not to balance the club, but that it should fall into your other hand and the cascade can be continued! It all happens in under a second, and looks impressive! Double / Triple spins In order to master some of the more difficult 3 club tricks (and to move on to 4+ club juggling), it is suggested that you learn how to do double or triple spins smoothly. By giving the clubs extra spin, the clubs can have more time in the air, which allows you some time to do other tricks such as flourishes (see below). To achieve double spins, work your way through the 3 club cascade tutorial once again, but this time use double spins instead of single spins! Repeat for triple spins also! Flourish When you are able to throw a club with double or triple spin from one hand, you should try to learn some basic flourishing moves with the same hand (such as wiping your forehead with the club, twirling the club like a baton, spinning the club on your hand etc). 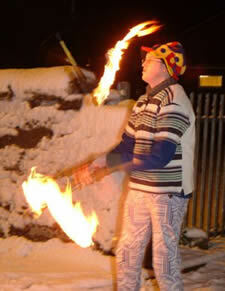 Fire Juggling Only to be attempted once you are very confident with juggling normal clubs. It is strongly suggested that you find someone to teach you how to safely use fire clubs, and not just attempt to learn by yourself. Once you have learned 3 Club Juggling, you could try learning 4 club juggling, or more 3 ball or 3 ring tricks (e-mail me and I will point you in the right direction!) 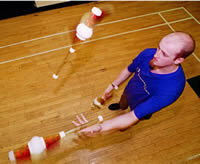 You could also take some time out from juggling and try Diabolo, Devilstick any many other props you can manipulate!